Gwendolen Raverat was a woman of a very precise time and place, and could not have thrived in any other era. The grand-daughter of Charles Darwin, she married a French dandy after a neo-Pagan nuptial ceremony in Cambridge attended by Rupert Brooke and Lytton Strachey, and described herself as ‘lonely and strange’. Rupert Brooke described her, not unaffectionately as ‘the square-headed woman who cuts wood’ and according to Frances Spalding’s biography, Raverat was a courageous, independently-minded character whose exquisite art belied her ‘logs and dogs’ facade. Her images are odd and beautiful, and the Sleeping Beauty – an unnamed woman asleep with two dogs curled up beside her – is part fairytale, part prosaic everyday life. 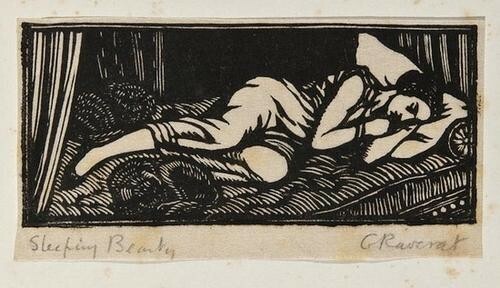 She provided wood engravings for editions of work by Laurence Sterne, Walter de la Mare and Hans Christian Andersen. Frances Spalding describes in this article how Raverat worked, detailing the delicacy and tenderness needed to create an engraving. Raverat killed herself after suffering a stroke, saying ‘this seems the simplest plan for everyone’. Years before, she had ended the life of her husband, whose multiple sclerosis had robbed him of his golden youth. Her sketch of him, near death, eyes wide in direct contact with the viewer, is desperately sad and yet unsentimental.